To me the year 1978 is very important. To me the year 1978 is very important. It is this year, an International Conference of Environmental Biologists was organized at D.A.V. College, Muzaffarnagar, U.P. (India), and as a result a new International Academic Organization, “The Academy of Environmental Biology” was born with me as an elected Founder President. The decision to launch a new International Research Journal was felt by the participating delegates of the conference. Consequently, the faculty members and the research students of the Department of Zoology in several meetings discussed this issue at length. In-spite of divergent views with particular reference of the finances involved in the venture, it was finally decided to take up the project realizing the need of quality research Journal focused on the areas of Environmental Sciences and Toxicology. 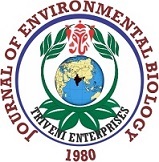 The title was decided and the formalities were completed, thus, “Journal of Environmental Biology” was launched on 7th October 1980, with me as Founder Editor-in-chief. Since its very inception, we had to face problems and difficulties - some merely because of inexperience and some created by vested interests. It was but natural to meet distrust and disfavor in certain quarters and indifference in others. These man-made hurdles of early years became so intense that even closure of Journal was once thought, but by God's grace publication of Journal continued uninterrupted. During the course of time, however, journal gained experience, prestige and stability- slowly and steadily. In 1997, the Registered Office of the journal shifted from Muzaffarnagar to Lucknow. By now the journal had gained recognition from the scientific community of the world due to scientific merits, print quality, attractive cover and also because of its well established selection and peer review mechanism. We are proud to announce that this year the Journal of Environmental Biology is entering its 40th year. Our growth and progress journey up to volume 40 (2019) to global acceptability and credibility are mainly because journal never strayed from the commitment to provide quality research to the worldwide researchers. Peer review & Editing of research papers are integral part of journal, it comprise of team of Editorial Board members collaborating with critical reviewers and our own R&D Division scientists. We follow impartial Double Blind Peer Review System to assess the suitability of manuscript for publicity. It not only weeds out unsuitable manuscripts but immensely help the authors to improve their manuscript. Our authors appreciate their contribution, as such we have decided that the reviewers' names should be reflected on the first page of the published paper, till then the reviewers names are kept anonymous. The names of those reviewers, who do not recommend manuscript for publication are kept anonymous. We feel pride to have dedicated, critical reviewers & editors for volunteering their knowledge and generously participating in this academic venture, whenever requested. In order to recognize the invaluable contribution of reviewers & editors in the progress of JEB, we have decided to publish their names on the first page of the published paper, they have reviewed or edited. Hope the scientific community will appreciate our initiative. The Research and Development (R & D) Division of our organization is a unique feature. It works under the guidance of a consultant - an eminent retired toxicologist and research scientist. R & D Division not only scrutinize the manuscripts for unethical practices (plagiarism), but also motivate the authors to modify their manuscripts in tune with reviewer reports and comments. In an effort to enhance the quality of research manuscripts, R & D further advises the author with the latest researches. R & D approval is necessary for releasing the acceptance letter. Immediately after the release of print version of the issue of the journal, the published papers are uploaded on website for open access. Online copy of both the abstracts as well as full length papers can be downloaded FREE from journal’s website: www.jeb.co.in. This has been done for wider utilization of research published in the journal, besides enhancing the global visibility of the authors and their research. The allotment of DOI number to each published paper further increases the citation and visibility of the paper and the authors. Till date, we have published Fifteen Special Issues in JEB, the first one being published in 2008. The special issues are based on the Proceedings of research manuscripts, presented in National and International conferences. They are not only well received but also appreciated by the scientific community. JEB's current ISI Impact Factor is 0.727 and NAAS rating is 6.70. With author's co-operation and team efforts we intend to increase the Impact Factor in the coming years. We also realize the importance of time when it comes to publish priority research for quicker dissemination of research, for this we have Rapid Publication Facility (RPF) for the authors. From 2018, we have introduced, “JEB International Award (Cash Prize of US$ 500)” for Best Paper published in the Journal of Environmental Biology every year to recognize and appreciate the significant and outstanding research papers that is being published in Journal. All original research papers published in the Journal during the year in question are considered for this Prize and International Selection Committee evaluate the best paper. The International Cash Prize for 2018 has been announced and the prize amount (US$ 500) with “Certificate of Excellence” has been sent to the first author of the paper. The announcement to this effect is given elsewhere in this issue also. We are proud on being leaders in transparency by facilitating a collaborative and robust approach to publication. The Editorial Office is always available to contributors to provide a timely, fair and honest appraisal to research papers through a pre- and -post submission enquiry. Finally, we thank everyone who has contributed to the success of the Journal - countless authors, reviewers, editorial board members, subscribers and scientists worldwide who have contributed to the progress of JEB. We are thankful to all of them and we look forward for their invaluable services to the Journal over the years to come.